Family living in the Orient, to which belong some well-known rabbinical authors. There are two main branches: one in Constantinople, and the other in Jerusalem. 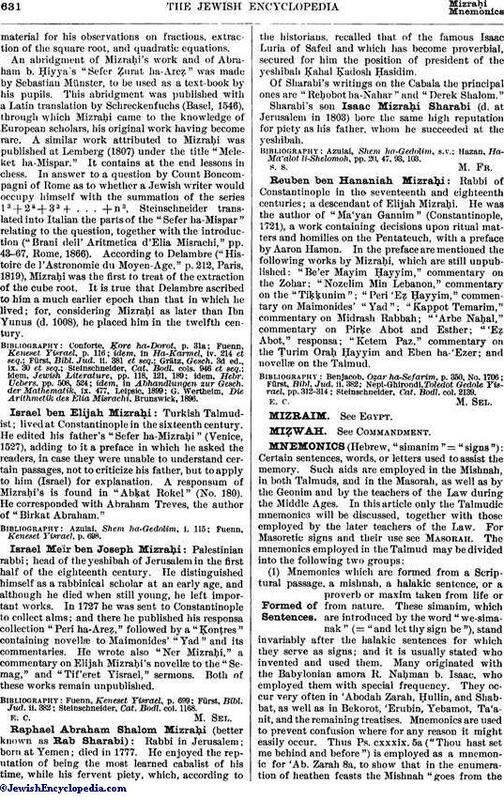 The name "Mizraḥi" signifies "an Oriental," and is used as a surname by many Persian Jews who have settled in Turkey. Shoḥeṭ at Jerusalem in the seventeenth and eighteenth centuries. He was the author of "Zikkaron li-Bene Yisrael," containing laws pertaining to ritual slaughtering. It was printed with Moses Ventura's "Yemin Mosheh," Amsterdam, 1718. Steinschneider, Cat. Bodl. col. 702. Oriental scholar of the fourteenth century. Abraham de Balmes in his "Miḳneh Abraham" (in the chapter on prosody) quotes a work by Mizraḥi entitled "Imre Shefer." This work was published by Carmoly, under the title "Ḳabbalah 'al Meleket ha-Shir" (Paris, 1841), from a Paris manuscript, in which it is indicated that it was composed in 1391. Among the models which Mizraḥi gives is the letter of Ibn Pulgar to Abner of Burgos, which Mizraḥi styles "shir meyuḥas" (noble poem, that is, a poem arranged in Mosaic style). Steinschneider, Jewish Literature, p. 177. Turkish rabbi and mathematician; born at Constantinople about 1455; died there 1525 or 1526. Mizraḥi was a pupil in Talmud and rabbinics of Elijah ha-Levi, who was known for his mild attitude toward the Karaites, whom he taught the Talmud (Mizraḥi, Responsa, Nos. 41, 57). But it appears from a letter of Elijah Capsali (see Grätz, "Gesch." 3d ed., viii. 448) that Mizraḥi studied also under Judah Minz of Padua, who warned him not to throw himself headlong into the quarrel between Joseph Colon and Moses Capsali. From this letter it is evident also that Elijah Mizraḥi is not to be identified, as he is by Conforte ("Ḳore ha-Dorot," p. 29a) and Azulai ("Shem ha-Gedolim," i. 22), with Elijah Parnes, who is mentioned in Colon's responsa, and who is called by Elijah Capsali a corrupt forger (comp. Zunz's notes to the "Itinerary" of Benjamin of Tudela, ed. Asher, ii. 40). (In the possession of Maurice Herrmann, New York. )Studies Mathematics. While still a young man, Mizraḥi distinguished himself as a Talmudist and as an authority in rabbinical matters, on which he was consulted by many rabbis even in the lifetime of Moses Capsali. Although he was very religious, yet he devoted a part of his time to the study of the secular sciences, particularly to mathematics and astronomy, which he studied under Mordecai Comtino (see letter of Delmedigo in Geiger, "Melo Ḥofnayim," p. 12). Mizraḥi for some time earned a livelihood by teaching Talmud, mathematics, astronomy, and other sciences; but owing to his weak constitution the work proved too hard for him (Mizraḥi, Responsa, No. 56). Though it would appear from his mathematical works that he read the Greek authors, it can not be said with certainty whether he read them in the original or in an Arabic translation. It is evident, however, that he was master of at least one, if not both, of these two languages. At the death of Moses Capsali (c. 1495), Mizraḥi succeeded him as grand rabbi or ḥakam bashi of the Ottoman empire, which office he held till his death. Like his predecessor, Mizraḥi had a seat in the divan assigned to him by the sultan beside the mufti and above the patriarch of the Christians. The work "Me'ora'ot 'Olam" (Constantinople, 1756) contains several legends in connection with Mizraḥi and the sultan (Nepi-Ghirondi, "Toledot Gedole Yisrael," p. 267). Mizraḥi, who had previously written against the Karaites and who had entered into polemics with Elijah Bashyaẓi (comp. the introduction to the latter's "Adderet Eliyahu"), changed his attitude toward them after he had become ḥakam bashi. Like his master, Elijah ha-Levi, he favored the idea of teaching the Talmud to the Karaites, provided the latter would abstain from reviling it. When the zealots, aiming at the destruction of every means of reconciliation between the Rabbinites and the Karaites, made so many restrictions with regard to the latter and threatened with excommunication those who would not observe them, Mizraḥi was not in Constantinople. When he returned he was indignant at the restrictions; he declared that it was the duty of the Rabbinites to consider the Karaites as Jews, and that Elijah ha-Levi and Eliezer Capsali, whose piety nobody doubted, were of the same opinion (Mizraḥi, Responsa, No. 57). He was opposed also to certain innovations of the cabalists with regard to the interpretation of the Bible (ib. No. 1). The following are Mizraḥi's rabbinical and exegetical works: "Tosefe Semag" (Constantinople, 1520), novellæ on Moses of Coucy's "Sefer Miẓwot Gadol," afterward published with the text under the title "Ḥiddushim" (ib. 1541); "Sefer ha-Mizraḥi" (Venice, 1527), a supercommentary on Rashi's commentary on the Pentateuch, "She'elot u-Teshubot," a collection of responsa in two parts: part i., containing 100 responsa (Constantinople, 1546); part ii., containing 39 responsa, printed with the responsa of Elijah ibn Ḥayyim under the title "Mayim 'Amuḳḳim" (Venice, 1647). Mizraḥi himself considered his commentary on Rashi the most important of his works (Responsa, Nos. 5, 78). Besides showing Rashi's Talmudic and midrashic sources, he endeavors to elucidate all obscure passages, thus defending him from the strictures of the later commentators, particularly Naḥmanides. The work was published after Mizraḥi's death by his son Israel, a fact which makes it possible to fix the approximate date of the author's death; for in Jan., 1525, he was still alive (comp. Benjamin Zeeb, Responsa, No. 284). A compendium made by Jacob Marcaria (?) was published under the title "Ḳiẓẓur Mizraḥi" (Riva di Trenta, 1561), and later one by Isaac ha-Kohen of Ostrog, entitled "Mattenat 'Ani" or "Ḳiẓẓur Mizraḥi" (Prague, 1604-9). Many commentaries and strictures were written on Mizraḥi's commentary, among the former being: "To'afot Re'em," by Mordecai Carvallo, and "Ḥayye Yiẓḥaḳ," by his son Isaac Carvallo (printed together, Leghorn, 1761); Eliakim Gatigno's "To'afot Re'em" (Smyrna, 1766); Isaac Ḥaddad's "Ḳarne Re'em" (Leghorn, 1768); Joseph of Milhau's (Muscat's) "Oẓerot Yosef" (ib. 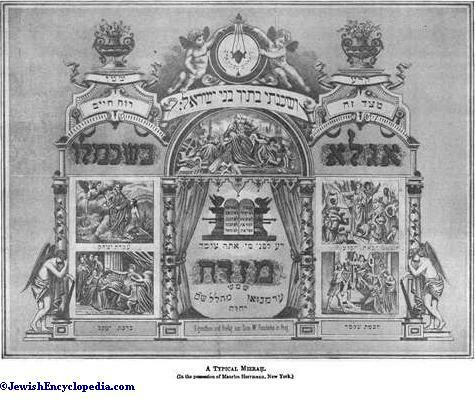 1783); and Moses Toledano's "Meleket ha-Ḳodesh" (ib. 1803). Among the critics were Samuel Edels ("Ḥiddushe Maharsha," Hanau, 1716) and Samuel Ẓarfati ("Nimmuḳe Shemu'el," Amsterdam, 1718). Mizraḥi's mathematical works are "Sefer ha-Mispar" (Constantinople, 1534), on arithmetic, and a commentary to Ptolemy's "Almagest" (no longer extant), of which Mizraḥi was very proud, no commentary having been previously written on that work. He says (Responsa, No. 5) that, owing to the importance of the science of astronomy, the study of which is considered as a "miẓwah" (good deed), he occupies himself daily with writing a commentary on the "Almagest." According to Delmedigo (l.c. 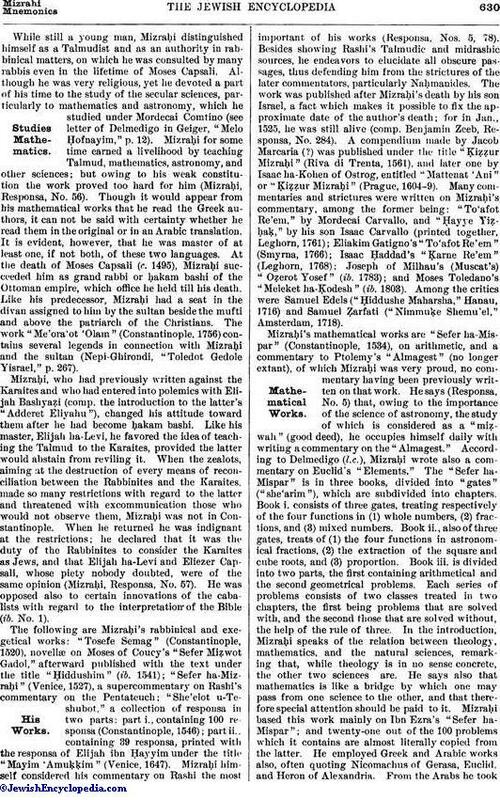 ), Mizraḥi wrote also a commentary on Euclid's "Elements." The "Sefer ha-Mispar" is in three books, divided into "gates" ("she'arim"), which are subdivided into chapters. Book i. consists of three gates, treating respectively of the four functions in (1) whole numbers, (2) fractions, and (3) mixed numbers. Book ii., also of three gates, treats of (1) the four functions in astronomical fractions, (2) the extraction of the square and cube roots, and (3) proportion. Book iii. is divided into two parts, the first containing arithmetical and the second geometrical problems. Each series of problems consists of two classes treated in two chapters, the first being problems that are solved with, and the second those that are solved without, the help of the rule of three. In the introduction, Mizraḥi speaks of the relation between theology, mathematics, and the natural sciences, remarking that, while theology is in no sense concrete, the other two sciences are. He says also that mathematics is like a bridge by which one may pass from one science to the other, and that therefore special attention should be paid to it. Mizraḥi based this work mainly on Ibn Ezra's "Sefer ha-Mispar"; and twenty-one out of the 100 problems which it contains are almost literally copied from the latter. He employed Greek and Arabic works also, often quoting Nicomachus of Gerasa, Euclid, and Heron of Alexandria. From the Arabs he tookmaterial for his observations on fractions, extraction of the square root, and quadratic equations. An abridgment of Mizraḥi's work and of Abraham b. Ḥiyya's "Sefer Ẓurat ha-Areẓ" was made by Sebastian Münster, to be used as a text-book by his pupils. This abridgment was published with a Latin translation by Schreckenfuchs (Basel, 1546), through which Mizraḥi came to the knowledge of European scholars, his original work having become rare. 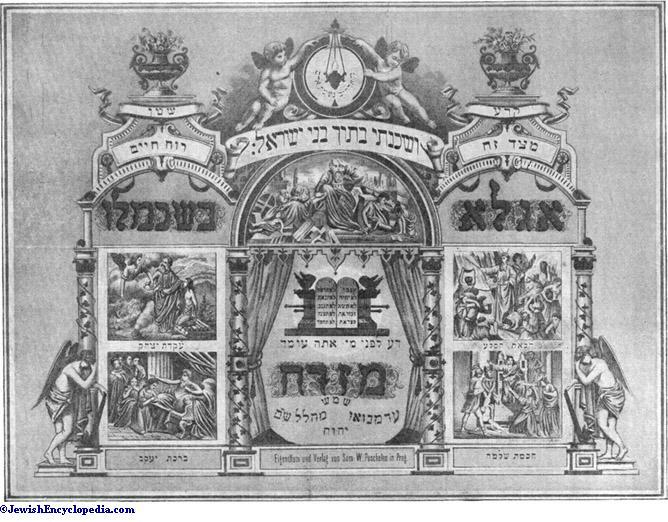 A similar work attributed to Mizraḥi was published at Lemberg (1807) under the title "Meleket ha-Mispar." It contains at the end lessons in chess. In answer to a question by Count Boncompagni of Rome as to whether a Jewish writer would occupy himself with the summation of the series 13 + 23 + 33 + . . . + n3, Steinschneider translated into Italian the parts of the "Sefer ha-Mispar" relating to the question, together with the introduction ("Brani dell' Aritmetica d'Elia Misrachi," pp. 43-67, Rome, 1866). According to Delambre ("Histoire de l'Astronomie du Moyen-Age," p. 212, Paris, 1819), Mizraḥi was the first to treat of the extraction of the cube root. It is true that Delambre ascribed to him a much earlier epoch than that in which he lived; for, considering Mizraḥi as later than Ibn Yunus (d. 1008), he placed him in the twelfth century. G. Wertheim, Die Arithmetik des Elia Misrachi, Brunswick, 1896. Turkish Talmudist; lived at Constantinople in the sixteenth century. He edited his father's "Sefer ha-Mizraḥi" (Venice, 1527), adding to it a preface in which he asked the readers, in case they were unable to understand certain passages, not to criticize his father, but to apply to him (Israel) for explanation. A responsum of Mizraḥi's is found in "Abḳat Rokel" (No. 180). He corresponded with Abraham Treves, the author of "Birkat Abraham." Fuenn, Keneset Yisrael, p. 698. Palestinian rabbi; head of the yeshibah of Jerusalem in the first half of the eighteenth century. He distinguished himself as a rabbinical scholar at an early age, and although he died when still young, he left important works. In 1727 he was sent to Constantinople to collect alms; and there he published his responsa collection "Peri ha-Areẓ," followed by a "Ḳonṭres" containing novellæ to Maimonides' "Yad" and its commentaries. He wrote also "Ner Mizraḥi," a commentary on Elijah Mizraḥi's novellæ to the "Semag," and "Tif'eret Yisrael," sermons. Both of these works remain unpublished. Steinschneider, Cat. Bodl. col. 1168. Rabbi in Jerusalem; born at Yemen; died in 1777. He enjoyed the reputation of being the most learned cabalist of his time, while his fervent piety, which, according to the historians, recalled that of the famous Isaac Luria of Safed and which has become proverbial, secured for him the position of president of the yeshibah Ḳahal Ḳadosh Ḥasidim. Of Sharabi's writings on the Cabala the principal ones are "Reḥobot ha-Nahar" and "Derek Shalom." 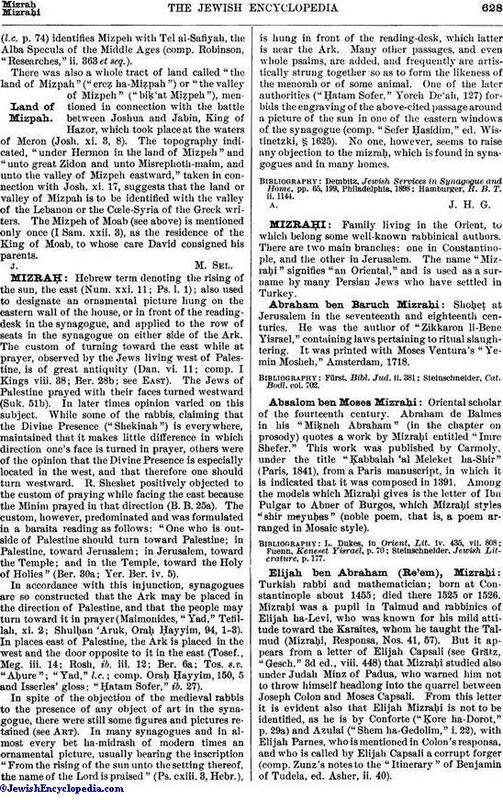 Sharabi's son Isaac Mizraḥi Sharabi (d. at Jerusalem in 1803) bore the same high reputation for piety as his father, whom he succeeded at the yeshibah. Hazan, Ha-Ma'alot li-Shelomoh, pp. 20, 47, 93, 103. Rabbi of Constantinople in the seventeenth and eighteenth centuries; a descendant of Elijah Mizraḥi. He was the author of "Ma'yan Gannim" (Constantinople, 1721), a work containing decisions upon ritual matters and homilies on the Pentateuch, with a preface by Aaron Hamon. In the preface are mentioned the following works by Mizraḥi, which are still unpublished: "Be'er Mayim Ḥayyim," commentary on the Zohar; "Nozelim Min Lebanon," commentary on the "Tiḳḳunim"; "Peri 'Eẓ Ḥayyim," commentary on Maimonides' "Yad"; "Kappot Temarim," commentary on Midrash Rabbah; "'Arbe Naḥal," commentary on Pirḳe Abot and Esther; "'Eẓ Abot," responsa; "Ketem Paz," commentary on the Ṭurim Oraḥ Ḥayyim and Eben ha-'Ezer; and novellæ on the Talmud.